Despite progress in recent decades, about 795 million people – or around one in nine – still suffer from chronic undernourishment or hunger. When food is scarce, women are the first to go short, or even go without. The fact is that there is enough food in the world to feed everyone, but not everyone gets enough food to eat. There are three major factors leading to food and nutrition insecurity: poverty prohibits people from buying food to feed themselves and their families; climate change affects food production, especially for small-scale farmers; and food waste and losses also contribute greatly to hunger. 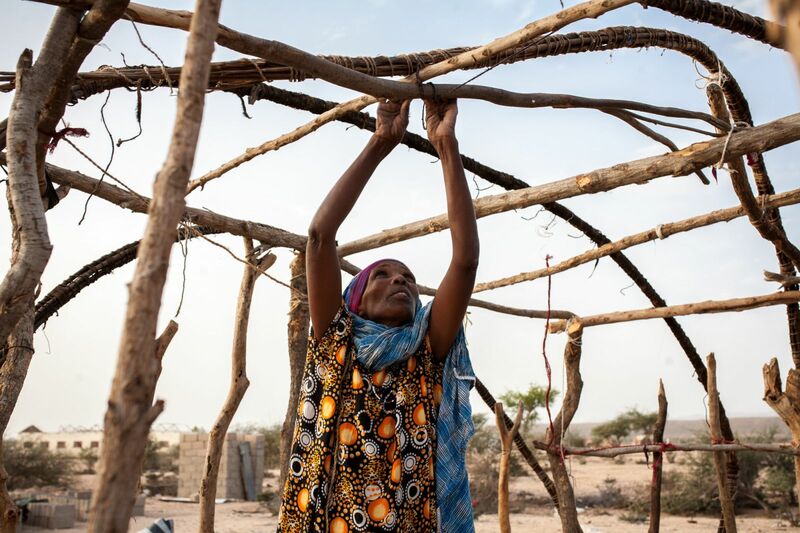 In the face of rising food insecurity, CARE is working in some of the world’s most vulnerable communities to ensure that no one need die from hunger or suffer chronic malnutrition. CARE works to help people find sustainable ways to make sure they know where their next meal is coming from and support long-term methods of reducing their vulnerability to hunger and malnutrition. This includes supporting farming households to ensure local markets are well stocked, managing natural resources so that they are less at risk from the effects of climate change, and strengthening livelihoods so that people are able to purchase foods. By the year 2020, we will help 50 million poor and vulnerable people to increase their food and nutrition security and their resilience to climate change. Read our CARE 2020 programme strategy summary on Food and Nutrition Security and Resilience to Climate Change here. 200 million children suffer from malnutrition. At least 3.5 million children under 5 years of age die from malnutrition every year. In many regions, poor nutrition is on the rise. Malnutrition affects every stage of life and can affect generations. Malnourished mothers are more likely to die in childbirth and have low birth-weight babies. Chronically malnourished children face lifelong consequences in reduced mental capacity, lower learning in school and reduced lifetime earnings. To address the causes of malnutrition, CARE provides food and nutritional support to vulnerable families. We also address the underlying causes of poverty, including the lack of access to livelihoods, to clean water and sanitation, and lack of control over land and natural resources. We focus on reducing gender equality because experience shows us malnutrition can be reduced when women are empowered. We also work closely with government to make sure that they have the long-term political commitment, good policies and are allocating resources for lasting improvements. CARE’s SHOUHARDO project in Bangladesh was focused on empowering women to make their children healthier. We helped women start businesses, supported them to participate in decisions about their children’s education, and supported the creation of women’s groups to confront early marriage, violence against women and limits on women’s mobility. By the end of the project, nearly half of the women had a say in decision about buying or selling household assets and child malnourishment plummeted by 28%. Women’s empowerment was the single most important strategy that led to this change, as outlined in this report and summary 4-pager. Farmers hold the key to reducing hunger and poverty. Impoverished people rely on agriculture for their livelihoods. In fact, a 10% increase in farm yields has been shown to lead to a 7% reduction in poverty in Africa. Good governance, gender equality and resilience to climate change are interlocking themes of CARE’s approach to strengthen sustainable, climate-resilient agriculture in developing countries we work in. CARE helps farmers to increase agricultural productivity through training and support in improved techniques and practices. To help respond to climate change, we have developed participatory community-based adaptation approaches. To increase wages of female workers, we provide training and support to women farmers, promoting women’s participation in community groups, and increasing women’s access to and control over resources. We have started Village Savings and Loans Associations (VSLAs) which help women save, start a business and get a loan, leading to empowerment and independence. Sustainable, Productive, Equitable and Resilient livelihoods, and food and nutrition security, in a changing climate. help individuals, families, communities and systems to become resilient - i.e. able to withstand and bounce back from environmental and economic shocks and stresses, including those exacerbated by climate change. Why clean water? Having access to basic clean water and a decent toilet saves children's lives, gives women a better chance to earn and income and ensures a good food supply. But CARE's work on water is not just about digging wells or building latrines. We work closely with women to lead their communities in changing critical hygiene practices, such as hand-washing. We work with government on policies, guidance and resource allocation, to ensure lasting improvements. And we link with wider efforts in critical integrated efforts on nutrition, education and adaptation to climatic shocks. CARE places emphasis on women in all of our water work. That's because impoverished women are disproportionately excluded from decisions regarding water's allocation and management. CARE provides women with equal decision-making power by including them in discussions on water and sanitation at the local, municipal and state levels. Women have more time for income-generating projects and school when they aren't spending hours each day hauling water. Access to safe water results in women spending less time caring for family members who would otherwise fall sick due to unsafe water. Also, improved sanitation can keep a girl in school by making facilities available to her when she reaches puberty.